Pakistan-based Khushhali Microfinance Bank has announced that it has gone live on Temenos’ T24 core banking system. The initial selection was in early 2017 and the project was headed by the supplier’s regional partner, National Data Consultants (NDC). In a customer announcement, the bank says the new system should ease the provision of real-time information and improve customer experience. Khushhali Bank is the first microfinance bank in Pakistan. It was founded in 2000 and has served five million customers since then. It was set up as part of the government’s programme to reduce poverty and develop the microfinance sector. The largest shareholder is United Bank Limited (UBL), with 29.7%. Temenos and NDC have a well-established customer base in Pakistan, including NIB Bank, Samba Bank and Soneri Bank. And there is a preconfigured ‘model bank’ version of T24 for the country. 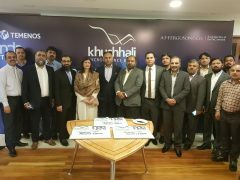 As well as T24, Khushhali Bank signed for the Temenos Connect digital front-end, FCM anti-money laundering (AML) system, Insight Analytics and Reporting system, and Risk. In February 2019, the bank also appointed local company, C Square, to deploy Genesys’ Contact Center/CX solution and the Advantage CRM platform. It is believed that T24 was taken to replace the Autobanker system from local supplier, Autosoft Dynamics. To be conducted under a new entity in Hong Kong.